The St. Louis Intercollegiate Athletic Conference (SLIAC) named 25 Webster University honorees to the 2018 Fall All-Academic Team on Tuesday. Gorlok athletes from the volleyball, soccer and cross country teams were given honors. The 2017 Webster University Women’s soccer team earned the United Soccer Coaches (USC) Team Academic Award for the 2017-18 academic year. The Women's soccer team has received the Team Academic Award every year of the program's existence which first began play in 1999. The squad posted a cumulative 3.41 grade point average (GPA) for the 2017-18 season. Webster University’s Women’s Soccer team and Coach Scire earned their 300th all-time victory this week in a 3-1 win over Westminster College. The women's soccer team is now the seventh athletic team at Webster University that has recorded at least 300 all-time victories. The St. Louis Intercollegiate Athletic Conference announced the members of their 2018 Hall of Fame Class, and one of this year's honorees is Webster alumna Christy Capkovic, a standout member of the University's women's soccer program from 2007-10. Capkovic will be honored during the league's annual Award Banquet, which is scheduled for May 15. Webster University and director of athletics, Scott Kilgallon, are pleased to announce five Gorlok greats as the newest members of its Athletics Hall of Fame. The 2018 inductees include; two of the top sharp-shooters and scorers in Webster men’s basketball history, a midfielder for men’s soccer who solidified the young program plus a defender who helped make it a perennial conference contender, and a volleyball player who led the Gorloks to the school’s first SLIAC Championship, while making that program a perennial conference power as well. 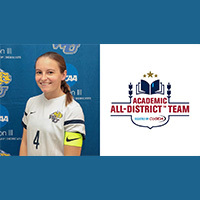 Webster University senior soccer player Brianna Pagan has been named to the College Sports Information Directors of America (CoSIDA) 2017 Academic All-District First Team. Pagan, from St. Louis, Missouri (Washington HS), becomes the first Academic All-District First Team selection for the Gorloks since Webster Athletics Hall of Famer Christy Capkovic in 2010. 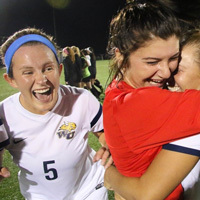 After its thrilling win to capture its thirteenth St. Louis Intercollegiate Athletic Conference Championship, the Webster University women's soccer team will play host Loras College in the first round of the NCAA III Regional, on Friday, Nov. 10 in Dubuque, IA. The Gorloks secured their place in the NCAA III Championships with a 1-0 win over Fontbonne University in the SLIAC Tournament on Saturday, Nov. 4. 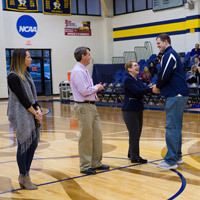 The 2017 Webster University Athletics Hall of Fame class was inducted in a Feb. 4 ceremony as part of a "pack the house" weekend coinciding with men's and women's basketball games on campus. Scott Kilgallon, director of Athletics, along with Webster University President Elizabeth (Beth) Stroble and Athletics coordinator Amy O'Brien, presented the inductees and award winners. Adding to its 17th consecutive Team Academic Award, the Webster University women's soccer team has earned its fifth consecutive National Soccer Coaches Association of America (NSCAA) 2016 Silver Team Ethics and Sportsmanship Award. The Gorloks were the only team in the St. Louis Intercollegiate Athletic Conference to qualify for the award. Webster University and Director of Athletics, Scott Kilgallon, are pleased to announce five Gorlok greats as the newest members of its Athletics Hall of Fame. The 2017 inductees include the two most prolific scorers in Webster women’s soccer history, a first-team All-American pitcher, one of the top scorers in men’s basketball, and a Josten’s Trophy national finalist. Webster University women's soccer player Brianna Pagan was named to the National Soccer Coaches Association of America's (NSCAA) 2016 NCAA III Scholar All-North/Central Region Second Team. Pagan was one of only two players from the St. Louis Intercollegiate Athletic Conference (SLIAC) recognized by the NSCAA for their academics. The 2015 Webster University women's soccer team earned the National Soccer Coaches Association of America (NSCAA) Team Academic Award for the 2015-16 academic year. This is the 17th consecutive year the Webster women have been honored by the NSCAA, receiving the award every year of the program's existence, since 1999. 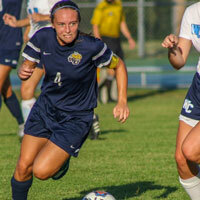 Webster University senior media communications major Ashley Mess was named a National Soccer Coaches Association of America (NSCAA) 2015 Scholar All-American, becoming the first women's soccer player in St. Louis Intercollegiate Athletic Conference (SLIAC) history to earn the distinction. The honor is selected from among more than 700 schools. Two Webster University women's soccer players were voted to the National Soccer Coaches Association of America's (NSCAA) 2015 NCAA III All-Central Region Team, including the first First Team selection in Webster program history. Senior Ashley Mess was named to the First Team while Sophomore Brianna Pagan was named to the Third Team for the second consecutive season. Both the Webster University men's and women's 2014 soccer teams earned Team Academic Awards for 2014-15 from the National Soccer Coaches Association of America (NSCAA). It's the 16th consecutive year for the women's team and the sixth in the last seven seasons for the men. Webster is one of only 222 colleges, out of 1900 schools in all divisions, to have both programs recognized.